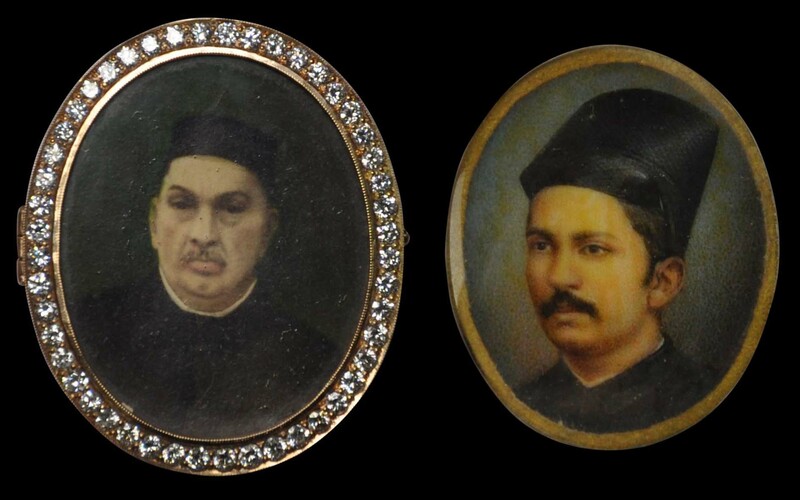 These two miniature portraits, one of which is mounted in a gold brooch set with 50 brilliant cut diamonds, show finely rendered Parsi gentlemen from 19th century Bombay. Both have a moustache and both wear headgear. 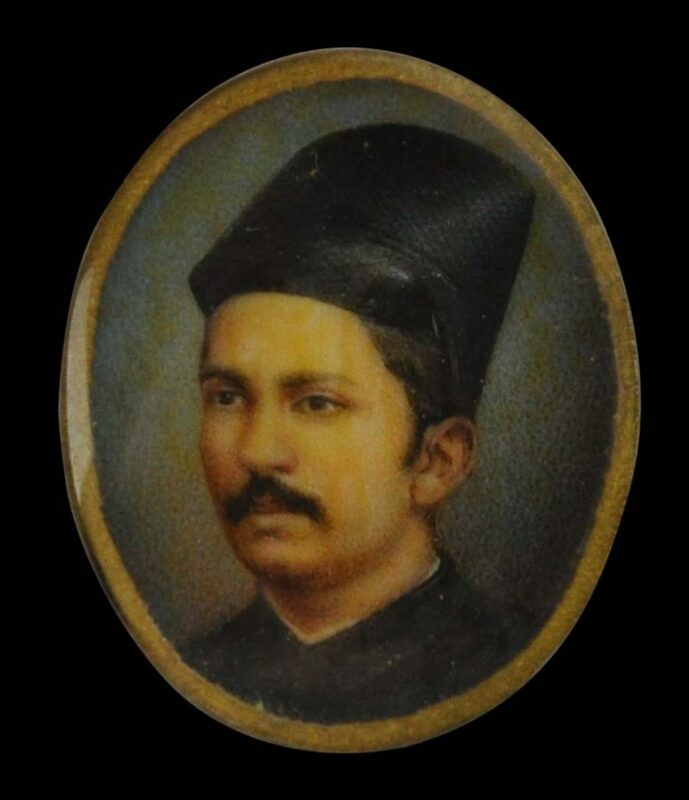 One wears a tall, black paghri, which was worn on ceremonial occasions. Such hats comprised cotton cloth that was wrapped over a cardboard substructure to give it its shape. The cloth was then lacquered and polished to make it shine. The other wears a lower hat, possibly a modified pheta which originally was based on what Zoroastrians in Persia once wore. Both portraits plaques are overlaid with thin layers of protective glass. Both are in excellent condition. Parsees subscribe to Zoroastrianism, one of the world’s oldest living religions. Darius was crowned king of Persia in 522 BC, and was the first of the Achaemenid kings to be confirmed as a true follower of Zoroaster. Ahura Mazda, proclaimed by Zoroaster as God, was mentioned and celebrated as Creator in many of Darius’ speeches. Today, probably there are fewer than 125,000 Parsees or Zoroastrians worldwide. Perhaps no more than 80,000 live in Mumbai/Bombay, a city of 14 million people, and no more than 6,000 live in Karachi in Pakistan. Like the Chinese of Southeast Asia, the Parsees of India and Pakistan are a distinct but exceptionally successful commercial minority. By the nineteenth century, Bombay’s Parsee families dominated the city’s commercial sector, particularly in spinning and dyeing and banking. 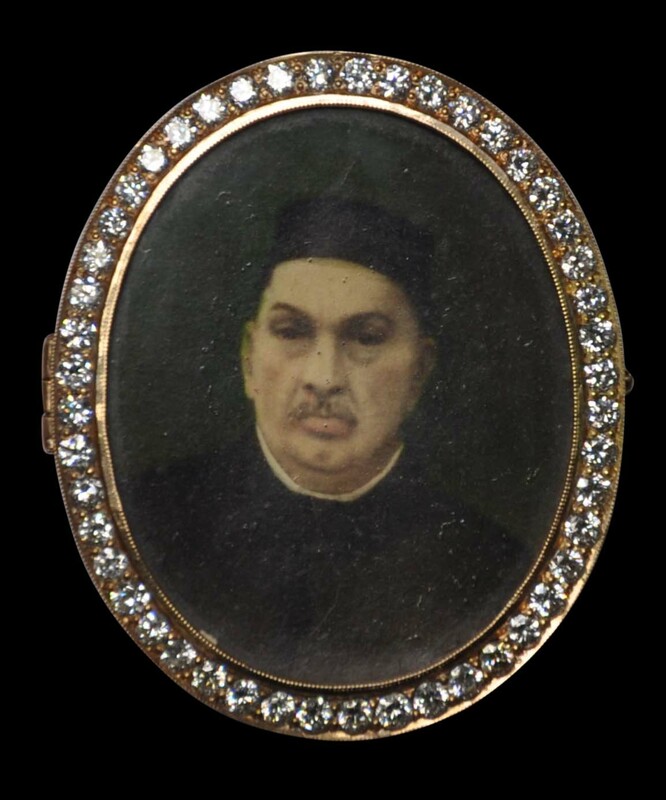 Wealth from these activities was put into property so that by 1855, it was estimated that Parsee families owned about half of the island of Bombay. Today, India’s most prominent Parsee family is the Tata Family, founders and owners of India’s most prominent conglomerate the Tata Group. Well off though they are as a community, the Parsees are dying out. It has been estimated that a thousand Parsees die each year in Mumbai, but only 300-400 are born. Today, one in five Mumbai Parsees is aged 65 or more. In 1901 the figure was one in fifty. Low birth rates are the main factor. Probably no Parsees remain in Burma today. Nonetheless, many vestiges of the Parsees’ contribution to commerce in South and East Asia remain. Apart from India’s giant Tata Group, smaller examples can be seen: small change offices in Hong Kong are known locally as ‘schroffs’ after a common Parsee surname, and in Singapore the road that runs alongside that country’s finance ministry is known as Parsi Road. Godrej, P.J. & F. Punthakey Mistree, A Zoroastrian Tapestry: Art, Religion & Culture, Mapin Publishing, 2002. Stewart, S. (ed. 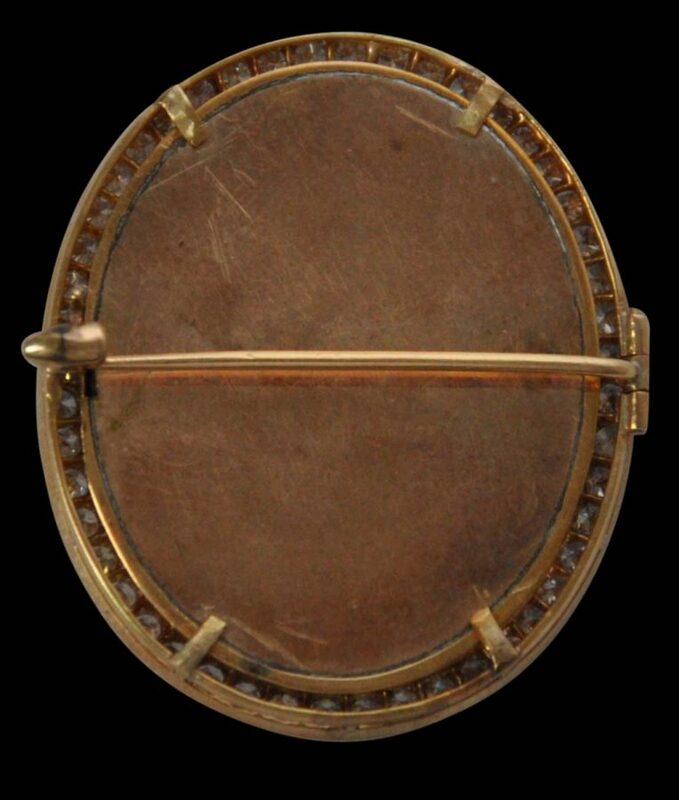 ), The Everlasting Flame: Zoroastrianism in History and Imagination, SOAS, 2013.